I am having a few problems with being able to get my boa boots on with the gaiters.. is there nack? 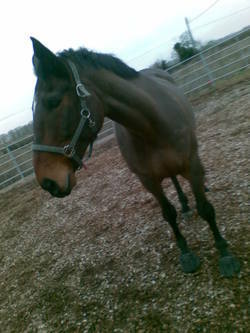 he's fine without them but they do start to rub after a while especially with this rubbish weather we are having! I am after trying the Easyboot bares but not sure if anyone has tried jumping in them, Murphys feet are big (size 4 Boa's) to match his 17hh frame! 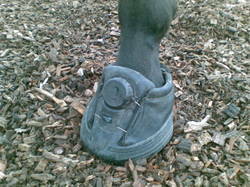 and heres a close up of him in a boot! he loves them and moves so well! I just get frustrated by the gaiters as they twist or scrunch into the boot too much? I am so pleased to be a part of Team Easyboot, and look forward to getting to "know" everyone better, and sharing what I've learned about natural hoof care and hoof boots. I've been around horses since a small girl when my dad started taking me horseback riding at a local stable. When I was 13, I got a "job" working as a trail guide at this stable, and never looked back. Once out of college I bought my first horse (a little over 15 years ago) and I've been fortunate enough to never be without one since. My husband and I currently have three horses, all barefoot. Two live at home with us, Flirt and Jinx, and the other, Foxy, is retired. He takes his job as companion animal to my friend's horse very seriously. We trim our own horse's hooves and use the Boa boots on the fronts to help them cope with all the rock we have here in this part of Missouri. My day job is a product development (mechanical design) engineer for a company that manufactures commercial cooking equipment, so I hope to bring a technical eye to any product testing in which I participate. Feel free to check out some articles I've written for a friend's website, Missouri Trailblazing, including my somewhat lengthy Boa Boot Review. In my rather biased opinion, this website is THE website for all things trail in the state of Missouri. Although in the past I've competed in various disciplines including dressage, western pleasure, and equitation, now my riding focus is non-competitive trail riding and I like to seek out varied and technically challenging trails. Missouri has many miles of trails and some day I hope to have ridden on every single one of them. Fortunately, we have more trails opening every year and I can't keep up with them! Out of the 100+ parks (local, state, and federal), I've ridden at about 30. Every year I make it to a few new ones so hopefully some day I can get to them all. Again, I am very honored and excited to be a member of Team Easyboot!